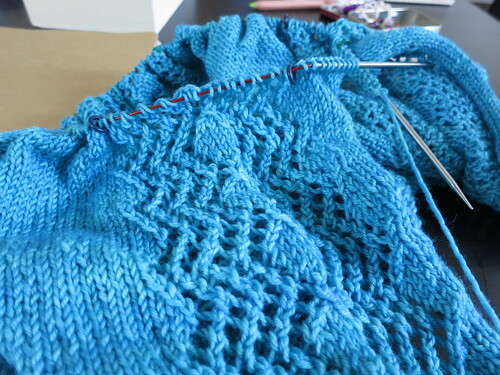 When last we caught up with my spring sweater project, I was just about to join the body and the sleeves to work the yoke – the final main step before the final finishing, so all was looking up! If you can see this thing coming, there is a solution – you can alternate skeins every 2-4 rows so that the dye lot change is less noticeable, and that would have actually worked in this case since the colour difference was not too severe. However, since I had to rip out five inches of knitting anyhow, and I had more yarn in waiting, I simply pulled out the offending skein and re-knit the rest of it with a new, matching one. So now, 10 days later, I’m back where I was a week ago! I press on, as do we all in knitting times. A few of you had more questions after my sock knitting post earlier this week – I’ll be back next time with some answers to those! If you have more sock knitting curiosities between now and next week, be sure to drop them and I’ll add them to the list. Have a great weekend, knitter friends! Da Da-Da Dum … (dramatic music cue). That’s so funny and so true! Keep your inspiration going … it speaks to me! Mismatched dye batch numbers are the pits! Just the other day I was going to start a new project. Out of my stash of wool I found two balls of the same wool…or so I thought! Gorgeous colour – a crushed boysenberry deep plum red! Lovely. But even holding the balls of wool apart, I could tell they didn’t match. And sure enough: same colour number but different dye batch number! I’m off to the wool shop on Monday. This time to buy MATCHING dye batch wool! Now that I can really see the true color of this I love it! Gaaaah!! Designer’s slogan: “We rip out and re-knit so you don’t have to!”. Once while knitting a baby sweater with self-striping yarn, I discovered that one skein (of the same dye lot!) was wound backwards so that the stripes were in reverse order. I was incensed as I ripped out half a front. How to you knit socks in the dark in a movie theater?!?! I’m working on your “So Simple” sock pattern and have paper and pen nearby to mark the 7th row for the cable, and have to look fairly often just to make sure I’m on a purl or knit!!!! Do you wear night vision goggles?! ?